In 1981, when I struck out on my own in journalism, I was using Leica rangefinder cameras that had yet to even incorporate a built in light meter. 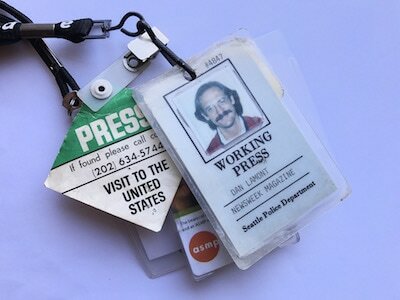 I was a globe-trotting photojournalist shooting Tri-X and Kodachrome and shipping it via courier (pre-FedEx). Telex was the way to reach an editor from the field. It’s all on Google and Wikipedia if you like history. As the digital revolution disrupted media markets I went back to school to study the technology and its impacts and try and figure out what lay ahead. A masters degree later I had some useful insight and a plan. It was pretty clear that to be successful and useful and relevant in “new media” individual media professionals and media content producing organizations had to understand and respond to the way their audiences were receiving, using and redistributing information. For me that meant not only focusing as I always have on getting an engaging, accurate and complete story but doing that by broadening my skill set to produce that story that could take maximum advantage of new media technology and distribution. The story needed to be ready for not just print but also the web, broadcast, social media and public presentation and display – available where the audience might be looking. That meant real multimedia – using the right tools (video, stills, graphics, text), to deliver the information across channels and platforms. That work is inherently collaborative. It meant building production teams with complementary skill sets to create the content packages that would feed the machine. What was needed was a “production company” and Tatoosh Media was born. After a few years of being nestled in my existing “parent” company, Tatoosh has fledged as its own independent LLC. Djordje Zlatanovic, who had worked with me back in the day, has become an owner/member of Tatoosh Media LLC and is its operations manager. Together we have assembled a team of top-notch talent and created production systems that truly address the needs of a “new media” content production. We are producing video and stills and informational graphics and text all centered on the core concept of authentic, accurate and engaging storytelling. Because we have the experience and knowledge base we can not only fulfill our clients visual storytelling needs but we can also help them, as consultants, so they better understand and can build their own digital content archiving systems. That way the content we produce is a real asset to their needs and goals over time. So, the newly fledged Tatoosh Media with this new and ever-evolving web site is off and running. In this section of the site we will of course bring our visitors up to speed on our recent work but we will also try to provide some real service journalism, offering perspective, advice and links regarding great storytelling and the industry, technology information architecture that will help those stories have the greatest and most enduring impact. I’ve had the privilege of telling some really fascinating stories for some of the world’s best publications, meeting some of the coolest folks you can imagine and working with non-profits and corporations that had the sense to understand the value of great storytelling.